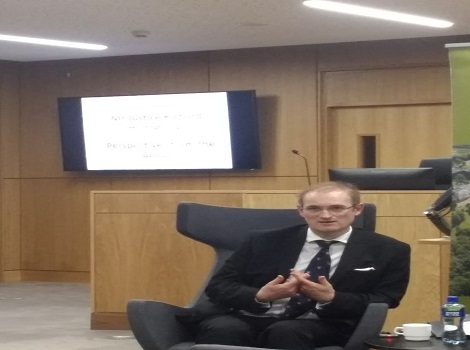 On Tuesday 6th November, the School of Law hosted an event in the appellate courtroom in the library featuring Mr Justice Richard Humpreys, Judge of the High Court, in conversation with Dr Laura Cahillane about aspects of judging in Ireland. The salon-type format covered topics such as training for judges, judicial criticism, advocacy, and judicial decision-making. The event was attended by students, staff and practitioners, who were all invited to contribute questions from the floor. The School would like to thank Mr Justice Humphreys for his generosity and for providing a fascinating insight into the judicial mind.